Want to be on stage in a Disney theme park. We'll show you how. The hallmark of the Disney parks is making guests feel special. In today’s celebrity culture, perhaps the quickest way to feeling special is getting cheers and applause from scores of total strangers. Lucky for you, Disney does a great job of giving guests the opportunity to do just that. There are many places at Walt Disney World where you can be in the spotlight and receive adoration, or at a least a bit of temporary envy, from fellow park goers. If you’re looking for your 15 minutes of Disney fame here’s how to find it. Did I show maybe a bit too much enthusiasm when I was in the Indiana Jones show? Welcome Family. These are the folks who get to stand up on the train station platform with the characters and wave to the crowd below. How to do this: A random selection. There’s no particular way to game the system. Just make sure you’re there early. Friendliness and enthusiasm couldn’t hurt. Parade participant/marshall. Wave to your fans! How to do this: Random selection. Cross your fingers and hope for the best. Flag Retreat Ceremony. At 5:00 p.m. each evening, a military veteran marches with a color guard and has the honor of taking down the American Flag. How to do this: Obviously you must be a military veteran. Stop by Guest Relations first thing in the morning to see if that day’s spot is available. Adventureland Pirate Parade. Children who have had makeovers at the Pirate’s League each day are invited to return at 4:00 p.m. (time subject to change, please confirm) to parade through Adventureland. How to do this: Have your child get a makeover at the Pirates League prior to 4:00 p.m.
How to do have a joke read: There will be instructions posted on overhead TV screens in the preshow area about how to text in a joke for consideration. You must have a text-capable cell phone to do this. Jokes should be G-rated, fairly short, and corny. The Jay Leno book, “How to be the Funniest Kid in the Whole Wide World,” includes many likely contenders. How to be “That Guy:” Usually an older, somewhat gruff gentleman. 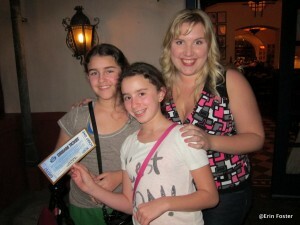 My daughters were THRILLED to speak with a Dream Ticket winner after her performanace at the American Idol Experience. Turtle Talk with Crush at the Seas with Nemo & Friends pavilion. Have a chat with Crush. How to do this: Crush almost always speaks with children. Make sure your child is seated on the floor with the other kids, raises his/her hand when appropriate, and look enthusiastic. World Showcase Players, UK pavilion. Be part of a wacky Britishy comedy troupe. How to do this: Check the Times Guide to see when the World Showcase Players will be appearing. Hang out and look enthusiastic. Ziti Sisters, Italy pavilion. Be part of a wacky Italian comedy troupe. How to do this: Check the Times Guide to see when the Ziti Sister will be appearing. Hang out and look enthusiastic. 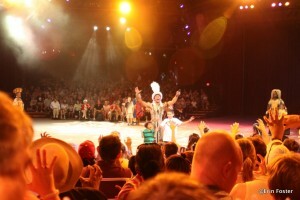 Leading the "animals" at the Lion King show. Studio Backlot Tour. Depending on the operational level of the attraction (which varies considerably) guest participation ranges from from a full-on soaking in the pre-show to nothing. How to do this: Speak with the cast member attendant at the front of the queue. He/she will be able to tell you what opportunities are available at the time of your visit. Lights, Motors, Action! Extreme Stunt Show. Guest gets to control one of the attraction vehicles via remote. How to do this: Chosen guest is almost always an elementary school aged boy. Try to sit near the front middle. The American Idol Experience. The big kahuna of on stage experiences. Sing your heart out in front of a thousand theme park tourists. There is an actual prize for each day’s big winner, the “Dream Ticket,” a FastPass to a real American Idol TV audition. How to do this: They’re looking for people who can actually, you know, sing. Show up at the park early and head to the audition center. Be prepared with 30 a capella seconds of any song. Sell it to the “producer” and they’ll walk you through the next steps. Indiana Jones Epic Stunt Spectacular. Be an extra in an Indy “movie.” Scream, run, hide, and look scared/angry on stage. How to do this: Participants must be adults. Look enthusiastic and wave like a crazy person during the selection process. Jedi Training Academy. Do battle with the dark side. How to do this: Have the Force be with you :-). Show up with your elementary age child at the sign in spot as soon as the park opens. Passes are now given out in the morning for all shows during the day, first come, first served. There are plenty of opportunities to display your mastery of the Force. Streetmosphere Player. Be part of the street entertainment, interact with the colorful cast. How to do this: When you see the Citizens of Hollywood begin to perform, step up and look enthusiastic. Disney Channel Rocks!. Interact with the rockin’ cast in front of the hat. How to do this: Check the Times Guide for the show performance schedule. Have your child sit front and center and look excited. Welcome Family. These are the folks who get to ride on the truck and welcome other guests to the park. Flights of Wonder. Sit on stage and have a HUGE bird zoom at your head. How to do this: Check the Times Guide for the show performance schedule. They’re looking for two guests holding cameras. Wave yours enthusiastically when they ask for volunteers. Festival of the Lion King. Lead a section of the audience in making animal noises. How to do this: Check the Times Guide for the show performance schedule. Sit up front and look enthusiastic. Show your spirit to dance with the Disney Channel Rocks crew. Hoop Dee Doo Musical Revue at Fort Wilderness. Play a part in the big Pioneer Hall Players finale production. How to do this: They’re looking for four volunteers: a preschool or early elementary age boy, a hunky late teen or young adult male, an attractive late teen or young adult female, and a big, burly often older male. If you fit one of those types, wave enthusiastically when they call for volunteers, otherwise save your breath. Cirque du Soliel show at Downtown Disney. Be part of one of the amazing daredevilish acts. How to do this: They’re looking for adults. It helps to be sitting near the front of the theater. Be aware that special experiences for adulation come and go. I’m still mourning the loss of Who Wants to Be a Millionaire. And there may be new or unique events that pop up from time to time. My oldest daughter had a gift for being “Disney chosen” when she was ages 4-6. During that time she got to wave a wand to open Fantasyland, ride on Dumbo with Minnie, and go up on stage and lead the band at the Biergarten. To the best of my knowledge, none of those opportunities for special treatment or attention are currently practiced, while other things have taken their place. So my star performers, are there opportunities for adulation that I’m missing? Have you gotten YOUR 15 minutes of fame in a Disney show or parade? Tell us about it in the comments below. We were at MK during the ‘Give a Day, Get a Day’ promotion, and we’re lucky enough to be chosen as one of the volunteer families to be in the parade on February 9th. As luck would have it, the parade was rained out that day, which CM Dean told us almost never happens. He asked us and othe other families chosen if we could return the next day. We told Dean that the next day was our Epcot day, and we only had MYW tickets. Dean left tickets for us at Will-Call to get back into MK the next day to be in the parade, so on February 10th, my 40th birthday, we rode in the fire engine at the beginning of the parade. CM Dean was so great to us and all of the families that day, that when we saw him again this past October at MK, we made sure to thank him again for our 15 minutes of fame. What an experience! Sorry to pull the thread off topic — Do they still do the give-a-day, get-a-day promotion? I was looking on the website, and I couldn’t find it, but I don’t want to assume anything. On topic 🙂 When I was at WDW last April, there were several people in the Monsters, Inc audience that were highlighted on the video screen. I was chosen for a Q&A segment. I was toward the middle, and there was space next to me by the aisle, which may have made it easy for the mic guy to sit next to me. And yes, there are often multiple people that have interactions in the Monster’s Inc. show. What a nice way to spend your birthday! It’s great they gave you extra tickets, too. Fun! So how nervous were you for AIE? My DD12 is a real performer, she’s counting the days until she’s old enough. I actually wasn’t nervous at all. The people running it were really awesome and they honestly want you to do well. Oh, and I almost forgot! Both my kids were picked for the Phineas and Ferb ‘movie’ while waiting in line for the meet and greet! It was so much fun! What a fun post! One question: I recently read that there is no longer a welcome family at Animal Kingdom. Has that changed back? 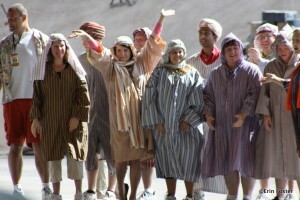 In March 2011 I got picked to get soaked in the Studio Backlot Tour. Made my kids day. Just happened to be the second family on line and they asked me if I would do it. Then the next day at AK my daughters got picked to lead our section in the Festival of the Lion King. The best was watching my 2 year old not walking fast enough that a cast member had to lead her by her hand. A lot of fun and really means our next trip to WDW has that much more to live up to. Your last sentence was interesting. My family has had several “chosen” experiences. We’ve always found that trip after that one is often a bit blah. We’re busy looking back at that super cool thing that happened last time. The good news is that if go often enough something else super cool will eventually come along. One trip a long long long time ago my family got picked for lots of stuff. My mom got to stuff fake chocolates in her bra along side Lucille Ball (via blue screen effect) in a show that used to be in MGM. I got picked for the sound effects show that had Chevy Chase (Monster Sound Show??). My sister also got picked to go on stage for a Ghostbusters thing at Universal. On a more recent trip (2004) my sister and I were on the boat that got attacked at the Backlot Tour. I was also chosen to be the one that “died”. 🙂 But I never got picked for the hot seat! I’ve had great luck being picked for shows at WDW. My best tip to get picked at the Indiana Jones Epic Stunt Spectacular is to bring something in a bright neon color (like a bandanna) to wave around when they are picking the cast. This has worked for me several times. That is a good tip. Thanks for sharing! My daughter was chosen outside of Beauty and the Beast Live On Stage to be the princess at the end of the show to receive the Beast’s Red Red Rose. We were escorted to the front of the auditorium and my daughter was shown where to stand when it was her moment. It was VERY MAGICAL! She received the rose, of course, but also a card commemorating the experience. Never on Disney property, but my Mum was chosen to be King Henry’s wife once at King Henry’s Feast! Oh how I miss it. Boo, Olive Garden. On our last trip, we had an onslaught of these opportunities! 1. My husband was “that guy” at Monsters Inc. These little experiences make the trips so much more memorable, and make great photo ops! I was going to mention Mickey’s Jingle Jungle Parade at Animal Kingdom as well. My daughter and I were picked to ride on Mickey’s float when we were at our Tusker House breakfast. It was the first day characters were available at lunch and several character managers were on hand. I guess we stood out because we were wearing matching Santa hats! My wife and I were selected to be in the Jammin’ Jungle Parade to ride in the first float (Rafiki’s Jeep) We were just sitting around at a table eating lunch when a manager approached us asking if we were going to stick around for the parade. When we said yes he asked if we would like to be in the parade. Our response… “Uh… YEA!” It was an amazing experience! Thanks Erin! I was in the bathroom when they picked him, and when my husband told me I thought why they heck are they rewarding a crabby kid? Ugh. But Disney wants to see smiles, and they got them! During the Christmas season there’s opportunity to be part of the tree lighting ceremonies or the Santa Clause parade. My youngest daughter was once whisked away from us only to appear up near the train station in Magic Kingdom holding Mickey’s hand while they did a countdown to the tree lighting. Told her she was now in hundreds of photos. The other daughter was very jealous! We were also there during the year 2000 celebrations when they did the parades in Epcot. Both daughters were plucked from the crowd and brought out to dance and walk in the parade. 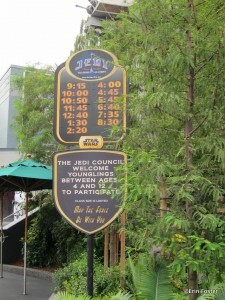 I was planning on taking my kids to get TSMM FASTpass first and then sign them up for Jedi Training. Do you know if I can still expect spots to be available if I sign up at 9:15? We went to HS last September on a VERY slow day. Immediately after rope drop, I ran to get FASTPASSES for TSMM with my daughter while my husband and son ran to sign up for the Jedi Training Academy. They were there within 5 minutes of rope drop, and his JTA spot was at 3:30pm. Again, this was a SLOW day. Things might be less crazy now that there’s no longer rope drop at HS. During Easter week, I went to get TSMM FPs while my niece, nephew and their parents signed up for Jedi Training. I was shocked that the Jedi times were going faster than the FPs. At about 8:15 (8:00 opening) the FP return times were 10:25. 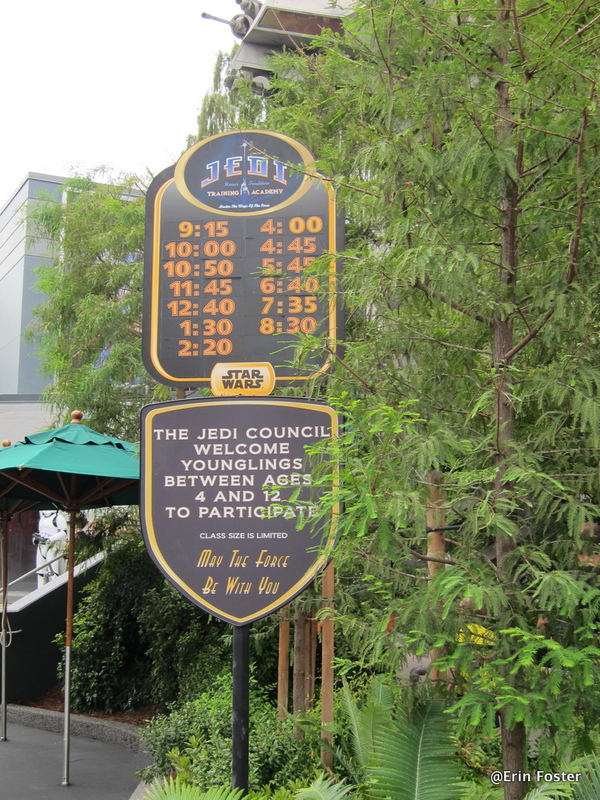 The Jedi “return times” were for 12:40. If you have an extra adult, split up. If not, perhaps sign up first, then grab FPs? I should point out that neither location had a line, so this suggests that people were being let in before the official opening…. Two years ago we were at the front of the Backlot Tour line when the CM asked for volunteers. I enthusiastically raised my hand while the folks I was with tried to blend into the wall. I was picked to be the captain. Thought I would do such a good job skippering that doomed boat, but once on the set I could not understand a bloody word coming over the loudspeakers, so of course I wasn’t looking where I should’ve looked, wasn’t steering, wasn’t calling, etc. Must’ve looked like an idiot, but of course that made it all the more entertaining for the audience. It was fun! Also, this wasn’t Disney, but during a day at Universal they randomly ended up picking my sister’s entire family to take part in the Universal equivalent of the backlot tour. They picked them one at a time – “Looking for a man…” and picked BIL; “Looking for a woman…” and picked sister; and so on. That was fun for the rest of us. On our last trip to WDW in Jan we were chosen as an honorary citizens Disney World we were given special buttons and a certificate. We were also given priority seating at the Lion King Festival of our choice and our children were all picked to not only lead the animal section (we were giraffes) but also be in the production. Our eldest son was chosen to be commended for his performance during the show too. It was quite an honor and made memories we will keep forever! BTW he still talks about how the “King” told him did such a great job! Love it! 2 times on the hot seat for Who Wants to Be a Millionaire?, both losing around the 8th question. As a little kid, I got picked for Hoop Dee Doo. I did Superstar Television twice as a kid, both times as Gilligan’s Island characters. LOL! It’s a family tradition! I want to be the rebel spy at Star Tours! But they always pick a cute kid. Also, doesn’t Yee Ha Bob usually involve guests in his show at Port Orleans Riverside? I believe I saw some Touring Plans celebs acting out the 12 Days of Christmas last December. LOL. I think to be featured at Monsters Laugh Floor you need to sit by one of the table lamps. When I was 21, my college friend and I were picked to get drenched in the DHS Backstage show. Since then I’ve been picked twice in two tries for the Flight of Wonder show. Let me tell you, that is one HUGE bird! For what it’s worth, both times I waved wildly with my camera in hand. And bit times I was sitting down front to the right of the seating area. When I was called on stage at Flights of Wonder I was in the second or third row, on the right side. And I had a big camera. Seems like a pattern. In 2009, during a December visit my then 4 year old son got to ring the magic Christmas bell to make all the decorations light up at the Biergarten restaurant at EPCOT. All the decorations were dark until he rang the bell. It was too cute! My 9-yr old daughter got to be Sergio’s assistant at the Italy Pavilion at Epcot, so you can add that one to the list. 🙂 Was a highlight of her trip!! One of my favorite memories my daughter was 3 we were at the world show case waiting to see Belle while talking to her Belle asked if we had met her friend Arura when my daughter said no they walked hand in hand through the world showcase to the front of the next line we took pictures and the two princesses went to “check on the castle” we got some great memories and a Disney photo pass person got some great pictures. We’ve had lots of opportunities to be a part of the show in WDW! Several trips ago, my boyfriend (now fiance) was chosen to be a part of the Indiana Jones Stunt Show…I watched and took pictures like a proud mother haha He also was a part of the Romeo and Edna (comedy group in Italy, no longer there) which was HILARIOUS. On a different trip, we were BOTH picked to be a part of the Ziti Sisters…I did a “run way show” and he was a superhero of some sort I believe. Then on our most recent trip, I was in a trivia game show with the Citizens of America in DHS in front of the hat. I won FPs to Tower of Terror from that one! We’ve been a part of the African dancers show in front of the Dawa Bar/Tusker House several times. These experiences are completely Disney to us and are a large part of the reason we keep returning, multiple times a year!! I was picked at Flights of Wonder to hold out the dollar bill and have the bird come “steal” it! Such a cool experience! I had a dollar out and was waving it around when they called for a volunteer, so I think that helped! My daughter was selected to talk with crush. A big thrill for her. Thanks for the advice. We rode Everest (twice) and then Dinosaur, just as the park was opening. YAY! Cool! Thanks for the reporting! Another great thing for kids that we were able to experience in the Studios is the “ribbon cutting” opening ceremony at the Brown Derby. The staff at the derby will choose one child (or children) to help open the restaurant – you are the “celebrity of the day”. They announce your name to all waiting in the lobby, allow you to cut a ribbon to the restaurant, at which point the wait staff takes photos like the paparazzi and throws mickey confetti. You are seated first in the restaurant, and later during your meal, the manager brings you the brown derby ‘newspaper’, touting your visit and some other tidbits about your celebrity status, along with your photos. An incredible experience, completely free, and one that we’ll remember forever as a magical moment. Oooh, that’s a fun one. I hadn’t heard about it before. That newspaper sounds like an awesome souvenir. In March of this year my husband got to do the Flag Ceremony which is really cool. Afterwards they have you march down main st. you feel like quite the celebrity. The Dapper Dan’s also asked my son to say the Pledge of Allegiance for the ceremony that made it extra special. The Photopass guy took a ton of photos also. 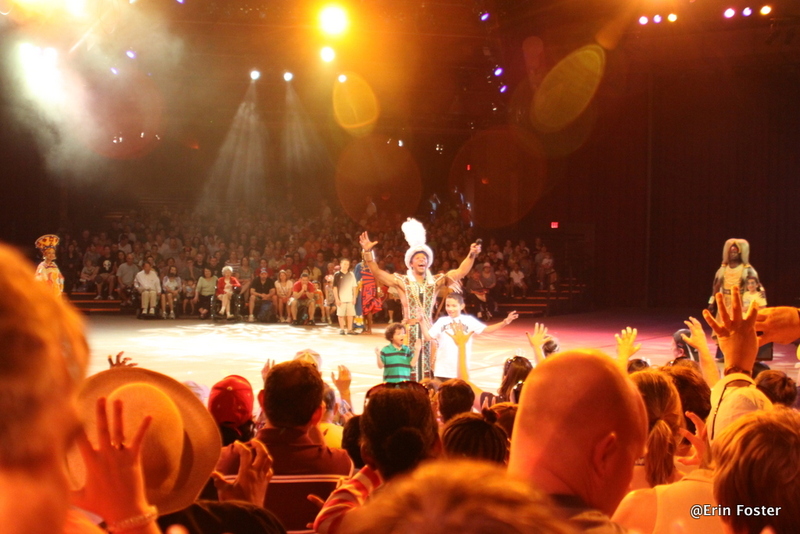 A note about the Festival of the Lion King show. Each section has a certain type of person they’re looking for to lead the sections. The elephant and the warthog sections usually pick a grown man. For the warthog section it’s typically the man that Zawadi (the gift) tells that his name in Swahili must mean “It’s my lucky day”. For the lion and giraffe sections it’s typically a child between the ages of 4-10. Both sections allow a sibling to be brought up with them. If you want you child to be chosen try to sit in the first row or the handicap area that doesn’t always fill up every show. Reason I know this. I’ve watched this show more times than I can count and I’ve noticed this pattern. At MNSSHP my son (age 5) was dressed as Agent P. When he went to see Phineas and Furb at a character spot, they took off his hat and being true to character he got down on his hands and knees to act like Perry. Phineas and Ferb loved it, they grabbed his hand and went running down the street with him. They took him right out to the parade that had just started to go by and the three of them stood right up front and watched it together. It made for awesome pictures and an evening we’ll talk about for years to come.